Editor’s Note: Abdolfattah Soltani is a well-known Iranian human rights lawyer, and spokesman for the Defenders of Human Rights Center, which was co-founded by the Nobel Peace-Prize-winner Shirin Ebadi. He has twice been incarcerated in Iran for political offences, in 2005 and 2009. (See http://en.wikipedia.org/wiki/Abdolfattah_Soltani) Mr. Soltani is one of the lead lawyers for the imprisoned former informal leaders of the Baha’i community of Iran. 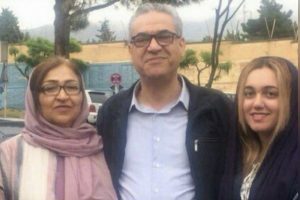 Committee of Human Rights Reporters – Having been arrested a year and a half ago, the seven leaders of the Bahá’í community of Iran known as the “Yaran” [Friends in Iran] remain in prison. Six of the seven were arrested on 25 Ordibehesht 1387 (May 14, 2008), and one was arrested on 15 Esfand 1386 (March 5, 2008). Now, having been in prison for more than a year and a half, these individuals are in a state of limbo. Jamaloddin Khanjani, Behrouz Tavakkoli, Saeed Rezaee, Mahvash Sabet, Fariba Kamalabadi, Afif Naeemi, and Vahid Tizfahm are the seven leaders of the Bahá’í community who took care of the day-to-day affairs of the Bahá’í community in Iran. Previously, their court trial was set for the 27th of Mordad (August 18), which was then postponed to the 26th of Mehr (October 18). It should be noted that prior to these dates, their trial had been scheduled to be held on 20 Tir (July 11). In an interview with Mr. Abdol-Fattah Soltani, one of the four attorneys on this case, Committee of Human Rights Reporters has examined the latest situation of these seven Bahá’ís. This interview was conducted on the evening of 25 Mehr (October 17), less than 24 hours before the court hearing of the imprisoned Bahá’ís [was scheduled to take place]. Committee of Human Rights Reporters: The court hearing for the seven leaders of the Bahá’í community is scheduled to be held on 26 Mehr (October 18). What is the latest on their situation? Will the hearing be held? If not, and if it is postponed, what would the reason be, in your opinion? In all likelihood, the hearing will not be held tomorrow. On 15 Shahrivar (September 6), I and other attorneys on this case objected to the temporary detention of these individuals. The deadline for the temporary detention had already expired, and the court did not have the legal right to extend the length of the temporary detention. The case was, therefore, sent to the appeals court to consider our objection. Cases of prisoners who are accused of a crime are usually considered within 4 to 5 days. But 40 days have passed since this case was sent to the appeals court, and we do not even know to which branch it has been sent. Our follow-up with the computer section [of the court] has been futile and they have not yet announced to us which branch is considering the case. This indicates that certain individuals do not want to hold a hearing. This is what we have predicted: in all likelihood no hearings will be held tomorrow, because the case has not yet been forwarded from the appeals court to the primary court – namely, Branch 28 of the Revolutionary Court. So long as the files have not been sent, naturally there is no possibility of a hearing. Committee of Human Rights Reporters: What is your analysis of the reasons why these seven individuals have been held for a year and a half? Is the postponement of their trial or keeping them in prison related to the current situation in Iran? There is no doubt that the circumstances which led to the arrest of the seven individuals, and confrontation with the Bahá’í community, were based on certain objectives; it can be said that after 17 months, these objectives are no longer operative, or at least it is perceived that those objectives have been achieved, because after such a long period of time since the arrest, the case is no longer of any benefit. Therefore, given international conditions, as well as the domestic situation in Iran, keeping the Bahá’í leaders in prison is nothing but a [political] cost for the authorities. This is especially true because these individuals were not politically active, and do not represent a political front. They were only active within the realm of their beliefs. In fact, keeping the seven Bahá’í leaders in prison only increases the weight of the burden of violations of human rights on the shoulders of the authorities. In my opinion, the authorities have reached this conclusion already, and they also wish to proceed with this case thoughtfully and tactfully, without confronting any problems. We predict that they will be released on bail within 1 or 2 months, because keeping them in prison is illegal. Of course, this outcome depends on the verdict of the judge and internal conditions. Committee of Human Rights Reporters: Mindful of the fact that another group of Bahá’í leaders were executed 25 years ago, can it be imagined that the authorities are looking for an opportunity to repeat that act, especially in light of the fact that these seven Bahá’ís have been accused of being “corrupt on earth” [a charge that may be based on a passage in the Qur’an, verse 17:4, which can carry the death penalty in Iran]? It is true that the charge has been brought against these seven individuals, but the likelihood that it becomes part of the proceedings is very very weak because the authorities know that such an action would be extremely [politically] costly. In my opinion, what is behind this case is the hardline movement of Hojjatiyeh [see http://en.wikipedia.org/wiki/Hojjatieh], an organization which opposed the Bahá’ís prior to the Iranian Revolution. But the wise right wing of the political spectrum is not interested in such verdicts, and I find it unlikely that the seven would confront a more severe charge. Committee of Human Rights Reporters: Concerning the charge of waging war [it is not clear against whom: against the regime? against God? ], if we consider both the physical and spiritual elements, has the physical involvement of the seven [in subversive acts] been proven? No physical evidence exists for any of the seven individuals on the charge brought against them. The charges are only in terms of generalities and, like many political and religious cases, contain no legal reasoning at all. Postscript: Once again, on 26 Mehr (October 18), the court hearing of the Bahá’í leaders was postponed. As of this moment, no new date has been announced for another court hearing. Committee of Human Rights and human rights lawyers in Iran, deserved Nobel prize 2009. I whole heartedly agree with A., the Committee of Human Rights and human rights lawyers in Iran, deserve universal recognition. 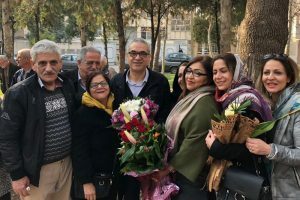 I hope with all possible hope that Mr. Soltani ‘s assessments are correct and the opportunity for bail exists for the seven Baha’i who have been held in Evin for so long. We must greet the possibility of such an outcome with the full force of our optimism. I think we must also appreciate the undeniable greatness of such individuals as Mr. Soltani. Has the Universal House of Justice ever acted to seek justice for the Baha’is of Iran through the International Criminal Court or Permanent Court of Arbitration to adjudicate these many injustices? There is reason to trust the analysis of the ‘management’ situation in Iran, in that those in control recently appointed the current chief prosecutor if my memory serves. The more general status of political situations, however, is that when one group is ‘in’, ambitious individuals bring up awkward situations. This is one of the dynamics of adversarial and publicity-based systems which shows how desperately mankind is in need of a system based on education, openness, group involvement and patience. Robert: The International Court of the League of Nations did rule for the Baha’is in the case of the seisure of Baha’u’llah’s house in Baghdad, but allowing the situation served the regime’s interests, just as the esteemed Mr. Soltani has said of the holding of these seven innocent people in unhealthy conditions for over a year and a half without legal process. Well, I guess the answer to my question about remains unanswered. I have found no evidence yet that the Universal House of Justice has sought justice through the highest courts in the world. As futile as the court procedure was with regard to the House of Baha’u’llah in Baghdad, maybe the Universal House of Justice regards the current world courts (the International Criminal Court or Permanent Court of Arbitration ) to be a waste of time so far as seeking justice. But also, the inner affairs of the Faith in Iran would necessarily be exposed in such judicial proceedings which could possibly bring out ex-Baha’is and other anti-Baha’i opinions whose voices would not be appreciated by the Universeral House of Justice in such an adjudication.